It was October 15. 2015. The Broadcasting Board of Governors, recently renamed the U.S. Agency for Global Media, heard some sound advice about the power of the five taxpayer-funded multimedia networks it leads. 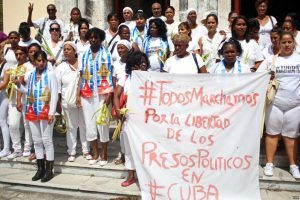 Damas de Blanco protest in Havana, Cuba, March 20, 2016, holidng a sign that reads “We all march for the freedom of political prisoners in Cuba,” (V. Macchi/VOA). “Today,” he continued, “the choice can be very clear. Seizing neighboring countries by force is not just another country’s ideology. Jailing political opponents in Havana or Caracas is not just an alternative lifestyle. “Mass enslavement of women and girls by ISIS is not just another way of exercising power. Mass kidnapping of African boys and forcing them to become soldiers is not just another way to govern. 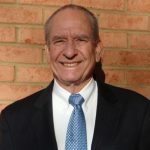 Powell, president of the Public Diplomacy Council and a senior fellow at the University of Southern California, stressed that he was speaking as a private citizen and that the views he expressed were his own. The five U.S. funded networks — Voice of America, Radio Free Europe/Radio Liberty, Radio Free Asia, the Middle East Broadcast Networks in Arabic and Radio-TV Marti in Spanish — reach 345,000,000 multimedia users every week. They increasingly share material, expanding the cutting edge of the truth described by Powell. Last September, Radio Free Asia broadcast a documentary entitled Behind the Walls: Three Uyghurs Detail Their Experience in China’s Secret Re-Education Camps. Mamatjan Juma of the RFA Uyghur Service and Chris Billing, the network’s executive producer, went to Turkey to track down former detainees and interview them on camera. 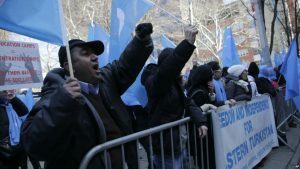 Uighurs and their supporters protest in front of the Permanent Mission of China to the United Nations in New York, March 15, 2018. Photo from VOA. One of the former prisoners, jailed for six months beginning in late 2016, described in vivid detail being shackled in leg irons with another detainee, and being forces to share a three meter by three meter cell with 14 other detainees. There was a single small mat on the floor so the occupants had to take turns sharing it, two people using one blanket and lying back to back. Later, these beleaguered Muslim Uyghurs were transferred to what their captors called “re-education camps.” Their daily classes were called “71 Facts About Religious Radicalism”, or “30 Indicators of Religious Extremism.” Throughout both ordeals, detainees were forced to memorize and sing patriotic songs in Mandarin. If they failed to learn, the beatings continued. Just last week, Radio Free Europe/Radio Liberty reported interviewing a former young female Uyghur prisoner after her release from what was termed by the government as “a vocational education center”, open to Chinese tourists invited to view innocuous looking classrooms and “students” in them at the edge of of one of dozens of such Xinjiang camps in the PRC. The young female detainee, interviewed in nearby Central Asia, said she and a cellmate were accused of “chewing gum” and detained in a separate ward. 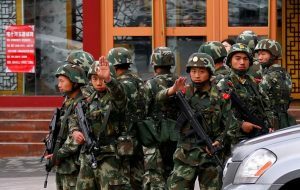 Paramilitary policemen gesture to stop a photographer from taking pictures as they stand guard after an explosives attack it downtown Urumqi in the Xinjiang Uighur Autonomous Region, May 23, 2014. Photo from VOA. And the Voice of America recently spoke with another former Uyghur detainee Mihrigul Tursan after her appearance at the National Press Club here in Washington. As VOA East Asia and Pacific Managing Editor Jing Zhang put it: “She described how she was taken into custody by Chinese authorities simply for taking overseas trips”. During her three-month detention, early last year, Ms. Tursan was placed in a room with 67 other female inmates ranging from 17 to 62 years old. The cell was an underground windowless room, and most women had been her neighbors before their arrest. Every morning, they were forced to sing songs praising President Xi Jinpin and the Communist Party. Ms. Tursan was grilled about her previous overseas trips and contacts. While in the so-called reeducation camp, she recalled, nine of her colleagues in the cell died. The U.N., the World Bank, and the International Committee of the Red Cross last September formed a partnership with technology powerhouses to launch a global initiative aimed at preventing famines. World Bank President Jim Young Kim told VOA: “The fact that millions of people, many of them children, still suffer from malnutrition and famine in the 21st century is a global tragedy.” The new global organization will work with Microsoft, Google, and Amazon web services to develop the Famine Action Network. The FAM will be an early warning system to identify food producing crisis areas likely to develop into full blown famines. Woman boarding a bus in downtown San Jose, Costa Rica on Jan. 7, 2015. Photo by Arnold Reinhold. From San Francisco, VOA’s Jan Sluizer told the story of U.S. Peace Corps volunteer Chase Adam, who returned from Costa Rica to California when his tour of duty was over. 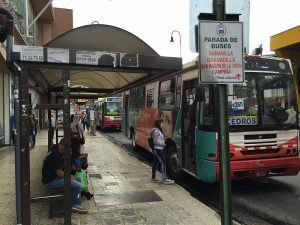 The PCV’s experiences during bus rides through the town of Watsi in Costa Rica left a lasting impression on Chase. Chase noticed how riders usually ignored pleas by impoverished passengers who passed hats around the buses for donations. They usually came back empty. But one day, there was a difference! A needy mother passed a hat containing a small red book describing a doctor’s diagnosis and need for critical lifesaving surgery for her son. Her hat was filled to the brim with coins and cash from sympathetic fellow Costa Rica passengers on the bus. The criteria: the medical cost of the treatment must not exceed $1,500 and significantly improve the lives of those helped. Chase used the web to seek contributions for doctors and health professionals in nearly two dozen countries. Among them were Kenya, Tanzania, Guatemala, Nepal and Cambodia. Since 2011, the Watsi Fund has collected $7 million for health care for 9,000 patients in 23 countries.